BUT MY SON IS!!! The kid loves the Eagles and he was dancing and singing and it was getting late and I was feeling like maybe we had better leave when the Men In Black show up. 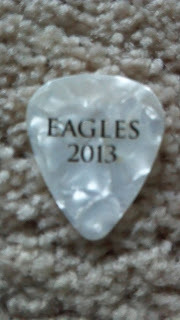 Glenn Frey had sent him some guitar picks. Jaws dropped all around. But that's nothing compared to what happened next. It happened so fast I didn't even have time to turn on my camera, so you will just have to believe me. I realize I'm known for over embellishing, but I don't. Really. I'm just a magnet for bizarre experiences. 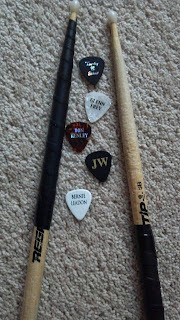 The Men in Black returned at the end of the show to say there were more guitar picks and he should go stand by the stage. We were sitting in front of Timothy B Schmit and we were really close. Then Glenn Frey comes to that side of the stage. My son smiles and waves and SWOOSH! 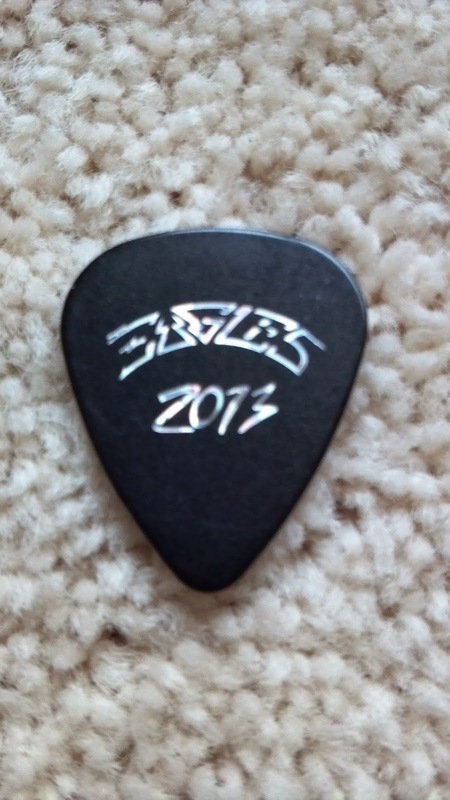 My little baby who used to weigh four pounds and live in an incubator was up on the stage with the EAGLES! My husband is so jealous. Yes! It was such a great show! Wish we could do it again! I was at the Eagles concert in Knoxville. I have a few jpeg files that show your son getting the drumsticks at the end of the show. I'd be glad to send them to you if I had your email address. Don't know how I missed this for a week! My son (not this one) had brain swelling when he was 18 months and I said a prayer that it shouldn't be him. Let it be me - and then it was. So, I am ok with it. I try to make sure my disability doesn't take away their childhood. And when they have an interest I try to follow it with them now in case I can't later. Everyone's time is limited, not just mine. I will think of Mrs Henley next time I am sick and hope she is having a better day than me.